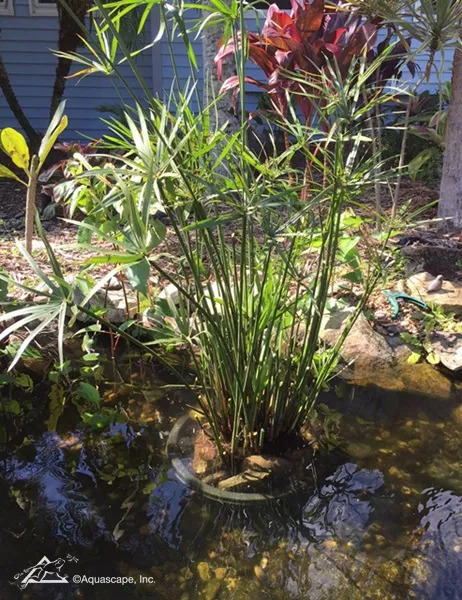 Pond Plant Feature: Umbrella Palm - Aquascape, Inc. Umbrella palm (Cyperus alternifolius) is a tropical plant that is hardy to Zone 7 that can grow to almost six feet in height. In colder climates, umbrella palm will over-winter if brought indoors and positioned near a sunny window. Dwarf (Cyp. Alt. ‘Gtracilis’) and medium (Cyperus spp.) varieties are available and prove an excellent choice for smaller ponds and container water gardens. The height of an umbrella palm creates a soft backdrop for shorter aquatic plants, such as water lilies. Larger palms can be invasive without some precautions. Even a small single stalk with roots will grow as a marginal and can be difficult to remove if left alone too long, especially in a graveled pond where the roots will grow deeply into the gravel. This situation can be avoided by planting the large variety of umbrella plant in a plastic tub. The palm will still grow into the tub and its roots will need trimming from time to time, but now the plant can be easily removed for maintenance. When ready for trimming, don’t worry about destroying the plant by cutting the roots into a smaller size. The plant will regrow again to fill the container. By trimming the root ball and cutting the plant in two, you’ll cut down on the size of the plant so there’s less “wind-sail” to blow it over. You can use a small handsaw to cut through the root ball to lower its height and also to cut the plant in half before repotting. Add the second plant to your pond or give it to a friend. 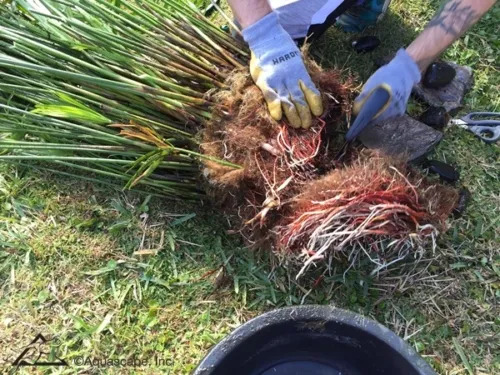 After the umbrella palm’s root ball is cut to a smaller size, rocks ranging in size from tennis balls to grapefruits are added around the root ball to anchor both the pot and the root ball so it’s not so prone to blowing over in the wind before the roots have a chance to reestablish. You do not need to add any dirt to the pot or fertilize the umbrella palm. They derive their nutrients directly from the pond water which helps filter the water and keep it safe for all your fish!